Cambridge, England, 2017-Feb-14 — /EPR HEALTHCARE NEWS/ — Resveratrol and lycopene are the compounds known for anti-ageing and cardio-protective properties. Mediterranean diet based, among others, on consumption of big quantities of lycopene-rich vegetables coincides with a longer lifespan, lower incidence of CVDs and reduced occurrence of some forms of cancer among the population of Mediterranean region. High resveratrol consumption is considered a factor in “French Paradox”, where epidemiological data show low incidence of CVDs, despite high consumption of saturated fats. Consumers have enormous choice of food supplements including lycopene and resveratrol, but key information is often missing: what happens to the substance once consumed and how much of it is really absorbed? Resveratrol is a phytochemical from polyphenols family, compounds known for their antioxidant properties. It is produced by plants in response to different stresses from their surrounding environment and found mainly in the peel and seeds of red grapes, also in peanuts and berries. High resveratrol consumption is considered a factor in “French Paradox”, where epidemiological data show apparent disconnect between the incidence of cardiovascular diseases in French population and high consumption of saturated fats. It is thought to be related to high consumption of red wine that contains resveratrol. There is significant scientific research on the beneficial effects of resveratrol relating to anti-ageing and longevity – activation of sirtuin enzymes, support of mitochondrial metabolism, protection of telomeres, antioxidant properties. It also supports cardiovascular health and influences glucose metabolism management. Lycopene belongs to family of plant-derived substances – carotenoids. Due to their strong antioxidative properties carotenoids help protect plants from oxidative damage caused by various stressing factors. Scientific interest in lycopene originates from the phenomenon of the Mediterranean diet and its’ cardio-protective and longevity promoting properties. The Mediterranean diet is based, among others, on high consumption of tomatoes and other vegetables that contain high levels of lycopene and other carotenoids. The population of the Mediterranean region has a longer lifespan, lower incidence of cardiovascular diseases and lower occurrence of some forms of cancer. Because of its’ antioxidative properties lycopene helps fight against free radicals in the skin, reduces its’ sensitivity to UV radiation, reduces mitochondrial DNA damage, lowers the risk of heart diseases. The main challenge of resveratrol supplementation remains its’ bioavailability. As quickly as it is absorbed from intestinal tract to bloodstream most of it is transformed into inactive compounds. 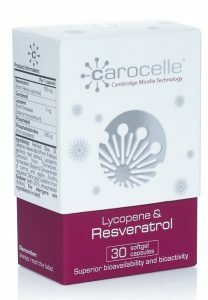 New Carocelle® Lycopene & Resveratrol formulation delivers superior bioavailability, proven in clinical trials. 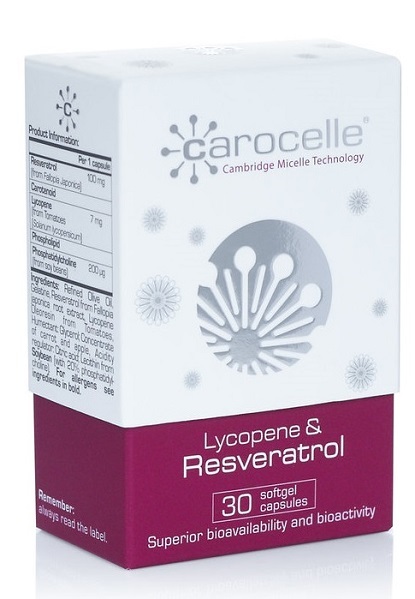 Carocelle® technology makes resveratrol over +500% more bioavailable than other products on the market and provides its’ outstanding concentration that would normally be difficult to obtain from other available sources. Pharmacokinetic tests for Carocelle® Lycopene have also confirmed 2x higher concentration of lycopene in the bloodstream (bioavailability) in comparison to reference brand available on the market, with the same dosage of the compound. Vesicle-micellisation helps carotenoids become more resistant to degradation in the highly acidic stomach environment. This ensures that more active lycopene and resveratrol can pass to the intestines and be absorbed. The vesicle-micelle format is easily transformed in the intestines by bile acids to the mixed micelles. This guarantees optimal absorption of fat-soluble ingredients, like lycopene and resveratrol. The result is increased delivery of active lycopene and resveratrol to the intestine for maximum absorption, improved bioavailability and remarkable bioactivity. Chaperone compounds in Carocelle® Lycopene & Resveratrol vesicle-micelles additionally contribute to increased bioavailability of both lycopene and resveratrol. Carocelle Cambridge Micelle Technology™ was founded in 2015 in collaboration with UK biotech firm Lycotec, headed by Dr. Ivan Petyaev. The company invents proprietary formulations and products that are scientifically tested and proven in laboratories in Cambridge, UK. Carocelle Cambridge Micelle Technology™ has its headquarters in Cambridge and operates a network of partnerships with research and commercial partners around the world. Dr. Petyaev is a medical doctor, researcher and author of scientific publications and inventions with applications in diagnostics, analytics, prevention and treatment of a variety of diseases. He spent his research years at MRS and Cambridge University in the Department of Pathology. To take his discoveries into innovative healthcare products he left University and set up his own company, Lycotec Limited. Dr Petyaev has wide experience of driving his innovations through the product development phase, clinical validation and in the setting up of industrial production of the successful prototypes. His projects have been supported by Cambridge University, the MRC, Papworth and Addenbrooke’s Hospitals, the British Heart Foundation, the Department for Trade and Industry and the Eurostars Eurica Project.